40 to 50 percent of Americans develop skin cancer at some point in their life. Thankfully, many common skin cancers can be treated by dermatologists and plastic surgeons using Mohs micrographic surgery. To become Mohs surgeons, dermatologists undergo rigorous surgical training. While their work removes up to 99 percent of skin cancers, if not treated effectively, cosmetically sensitive areas such as the scalp, forehead, eyelid, nose, cheek, lip or ear can be seriously damaged. In such cases, dermatologists perform Mohs surgery in tandem with plastic surgeons who perform Mohs reconstruction. Together, these specialists can achieve almost miraculous outcomes. Zwivel had the honor of learning about Mohs techniques from two leading experts in the field. 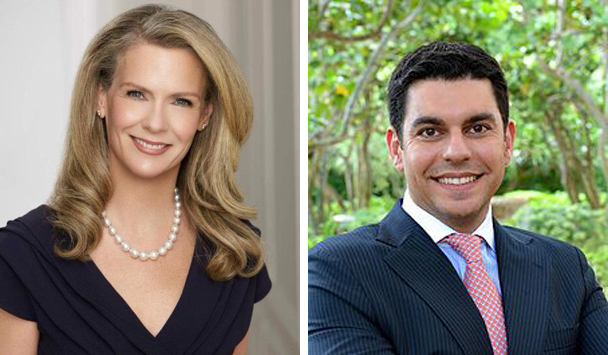 New York City dermatologist Dr. Janet Prystowsky has been performing Mohs surgery for over twenty years, and Dr. Jean Paul Azzi is a Palm Beach facial plastic and reconstructive surgeon who specializes exclusively in cosmetic and reconstructive procedures of the face, nose and neck. 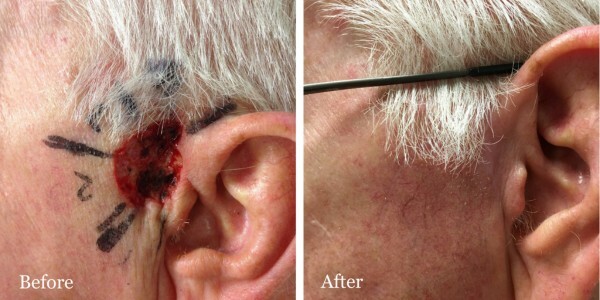 A word of warning: be prepared to be a little shocked — there are some very graphic images of Mohs surgery and reconstruction below. Still, while the before images may be initially disturbing, the after results are truly impressive. Mohs micrographic surgery was developed by Dr Frederick Mohs in the 1930’s, and remains the gold standard for treatment of skin cancers in the head and neck region. Mohs surgery is most commonly used to treat basal and squamous cell carcinomas – the two most common types of skin cancer. According to the Skin Cancer Foundation, each year more than 4 million Americans are diagnosed with basal cell carcinomas. The epidermis (the outermost layer of the skin) is made up of five layers, the deepest layer being the basal layer. As it’s name suggests, uncontrolled lesions and growths can arise in these basal cells. Basal cell cancer appears as pink growths, sores, shiny bumps and red patches. And like many skin cancers, it is caused by sun exposure — both long time exposure and more severe exposure that leads to sunburn. Basal cell carcinoma almost never spreads from the original tumor site, so it’s rarely a life-threatening condition. However, it does require intervention as it can leave you disfigured if not treated promptly. People with fair skin, blond or red hair, and blue, green, or grey eyes, have the highest risk of developing basal cell carcinoma. In the past three decades, the rate of squamous cell diagnosis has increased by 200 percent. Each year, more than one million squamous cell carcinomas are diagnosed in the United States. And unfortunately, almost nine thousand people die from these cancerous lesions. Squamous cell carcinoma also occur in the epidermis but, within different cells. These appear as elevated growths, warts that may crust or bleed, open sores, and scaly red patches. If allowed to grow they can become disfiguring and life threatening. Squamous cell carcinoma are caused by long term sun exposure, intense sun exposure in the summer months, and prolonged use of tanning beds. In fact, more than 400,000 squamous cell carcinoma each year are linked to indoor sunbed tanning, the majority of cases being in women. 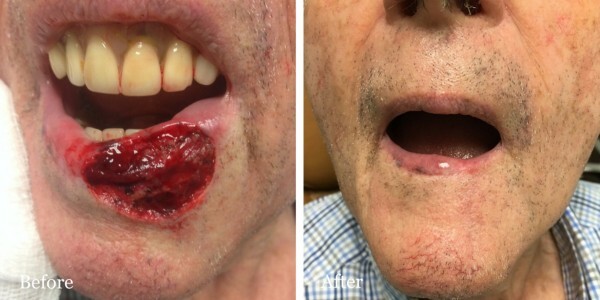 Though squamous cell carcinoma can occur anywhere on the body, they are more common in sun exposed areas such as the rim of the ear, lower lip, face, balding scalp, neck, hands, arms and legs. 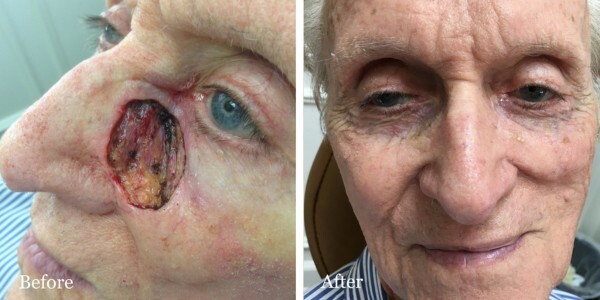 Although the goal of your dermatologist is to produce the best cosmetic results, scarring is common and often unavoidable after Mohs surgery. However, scars are usually small or imperceptible when compared to other excision procedures. Mohs reconstruction is performed by specialized facial plastic surgeons like Dr. Jean Paul Azzi, most commonly on the cheeks, nose, ears, eyelids, neck, lips and scalp. And as you can see by the before and after images below, Dr. Azzi’s surgical skill produces results that are almost invisible. According to Dr. Azzi, under most circumstances, you will not be left to live with any significant disfigurement for any length of time. 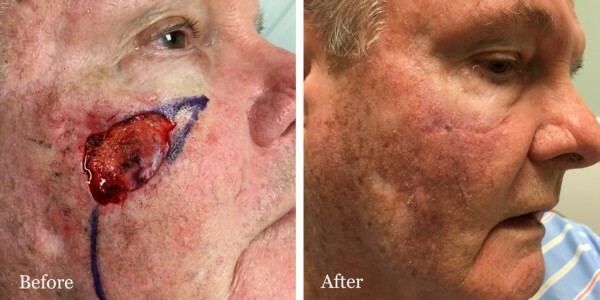 “Most dermatologists are conscientious enough to arrange for reconstruction with a facial plastic surgeon before the Mohs surgery is even performed,” he says. “In my practice we routinely coordinate with dermatologists, even those who are sometimes located several hours away. 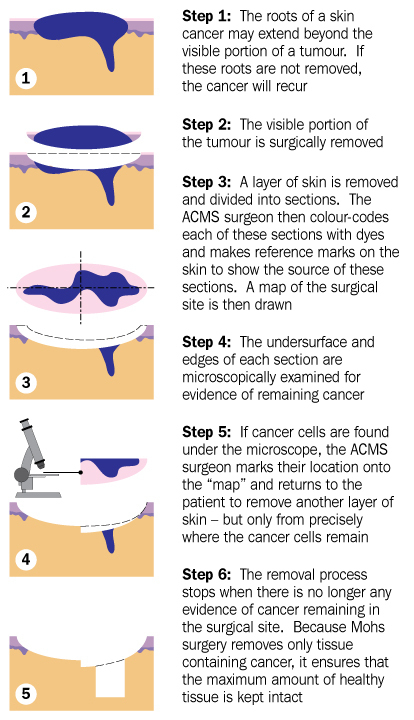 This allows patients to come for a consult with me to evaluate the skin cancer before excision and then allows the patient to come for reconstruction immediately after their Mohs surgery is complete,” adds Dr. Azzi. The reconstruction frequently takes place on the very same day. “Defects can be repaired days or weeks after the ‘hole’ is made. Though ideally, I prefer to repair defects the same day they are made by the dermatologist. It’s best for patient comfort,” adds Dr. Azzi. 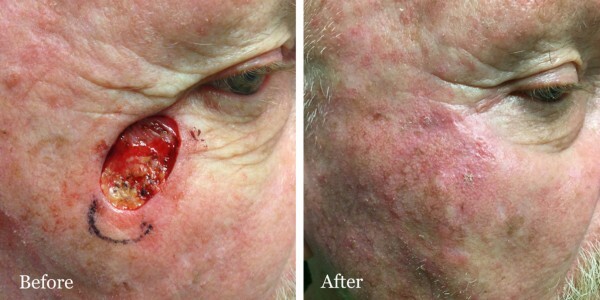 Most dermatologists are conscientious enough to arrange for reconstruction before the Mohs surgery is even performed. Like Mohs, reconstruction is also performed in your plastic surgeon’s private office under local anesthesia. Because every person’s ‘hole’ is different, Dr. Azzi advises that your surgeon will carefully evaluate the size, location, skin laxity, and orientation of every defect before choosing a reconstructive option. “I use countless types of flaps and grafts to repair defects. 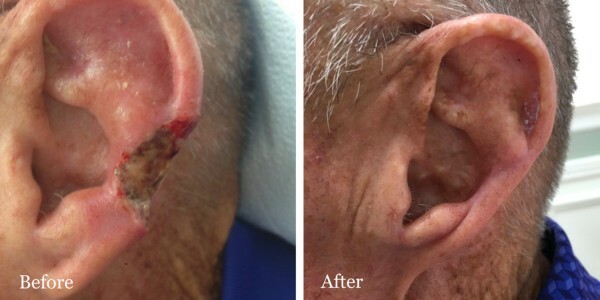 Flaps are the most common reconstructive method I use. Another term for them is ‘adjacent tissue transfer.’ These involve designing a reconstruction where tissue next to the flap is moved into the defect so it is repaired. Grafts involve borrowing skin from another part of the face or body and transferring it to the defect site,” says Dr. Azzi. If you are unfortunate enough to acquire skin cancer, you can feel confident knowing that Mohs surgery has a high cure rate — it’s 99 percent successful for cancer removal! And when you choose doctors with expertise, you can continue living life as if nothing had happened. 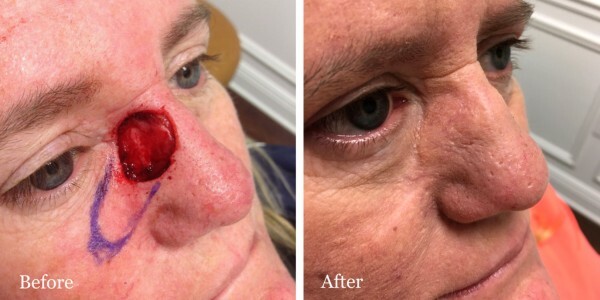 As you can tell from the images above, dermatologists and plastic surgeons working in tandem produce cosmetically pleasing results that patients are very satisfied with.